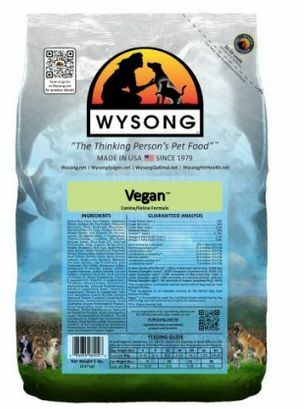 If you are vegan, then you might have an ethical dilemma in feeding your companion animal conventional dog food made from meat and animal ingredients. 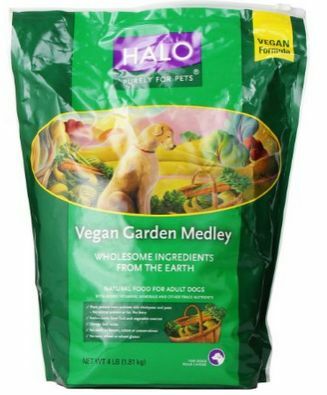 It is completely possible to feed a dog an all-vegan diet, and there are many vegan dog food brands. However, it will take a bit more planning and consideration to keep your dog healthy on a vegan diet. 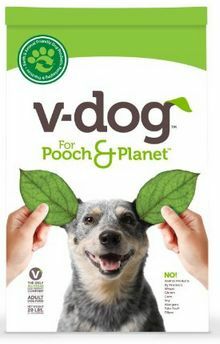 Here is what you need to know about vegan nutrition for dogs and the top vegan dog food brands. Dogs are classified as carnivores and will almost always choose meat over plant foods. However, the classification as “carnivore” is a bit misleading. Unlike cats (who are true carnivores), dogs are perfectly capable of getting nutrients from plant foods. In fact, in the 40,000 years of their domestication, dogs have evolved to eat a starch-rich diet. Research in the journal Nature which looks at the differences between dogs and wolves confirms this. In fact, dogs are unable to survive on an all meat diet! 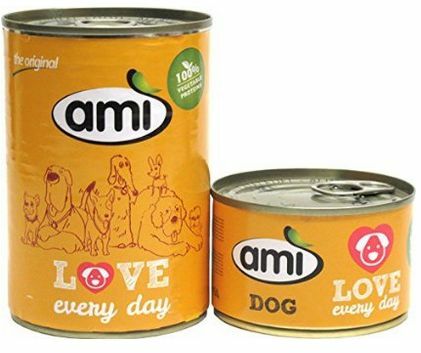 About 30 years ago, dogs were still considered to be true carnivores and there was a push towards “All Meat Dogs” and brands of dog food began making “All Meat” canned dog food. The result? Dogs began to get weak, thin, sick, develop metabolic disorder and lose their hair. Yes, it may be “natural” for dogs to eat meat. But, as James O’Heare says, this is irrelevant. “Dogs are capable physically of meeting their nutritional requirements without the need for animal products. “Natural” must not be confused with sufficient or optimal. Invoking the term “natural” does not tell us whether a particular diet is sufficient or optimal to meet the dog’s daily nutrient requirements. The diet composed of meat and other ingredients, if formulated to be balanced and complete, is usually sufficient and often optimal. This cannot be denied. Diets without animal products can also be formulated to be balanced and complete, easily meeting the sufficiency criterion and the optimum criterion as well, if formulated with care…The better approach is to look at the nutritional requirements of a species and identify ingredients that can meet those requirements. The most important principles to understand here is that dogs do not have specific ingredient requirements; they have specific nutrient requirements. If you are switching your dog to a vegan diet, the most important thing to realize is that dogs have different digestion systems and nutritional needs than humans. What works for you on a vegan diet isn’t necessarily going to work for your dog. 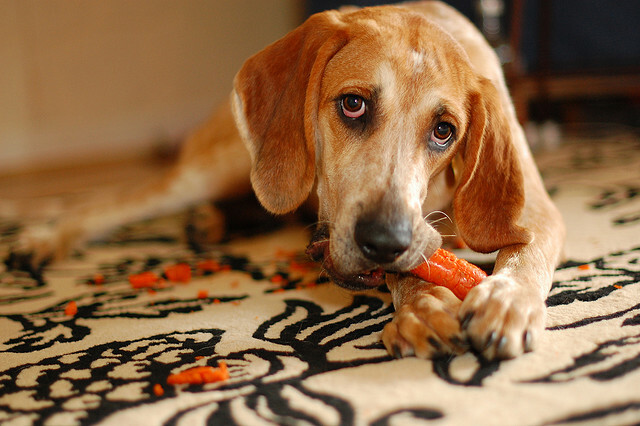 Don’t give your dog your food scraps and expect it to thrive. Sure, it might survive, but there is a big difference between surviving and thriving. Here are the most important nutrients you will need to know about when feeding your dog a vegan diet. It may not be difficult for you to get enough protein on a vegan diet, but this isn’t necessarily the case for your dog. The AAFCO, which sets the standards for pet food, has set the minimum protein requirement per dry weight at 18% (and 22% for puppy food). Some low-active dogs might be find with 18% protein, but experts generally recommend around 25-30% protein for active and growing dogs. A dog food which consists of 18% protein from meat may be adequate to meet your dog’s protein requirements, whereas a dog food which has 18% protein from corn may not be adequate. When choosing vegan dog food, choose options with higher protein percentages to compensate for the lower assimilation of vegetable proteins. *About 30% of protein goes towards maintaining skin and coat, so the first sign of protein deficiency will probably be a poor coat. It isn’t just the percentage of protein which you need to worry about when feeding your dog a vegan diet. Amino acids are the building blocks of protein, and you need to make sure you dog gets all the necessary amino acids. There are 23 amino acids which dogs need. Of these, 10 are “essential” amino acids, meaning the dog must obtain them through food. The other 13 amino acids are “non-essential” for dogs. This doesn’t mean the dog doesn’t need them. It just means that the dog can manufacture them out of the essential amino acids. The 10 essential amino acids are: arginine, histidine, isoleucine, leucine, lysine, methionine, phenylalanine, threonine, tryptophan and valine. All of these essential amino acids for dogs can be found in vegan foods. However, some aren’t as readily available as others. If making your own vegan dog food, you will likely need to combine proteins to make sure your dog is getting enough of each type of essential amino acid. 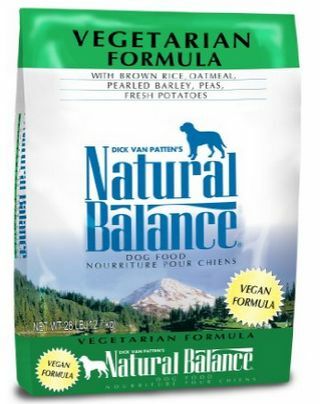 Commercial vegan dog foods are usually formulated to provide the right amino acids. These amino acids deserve special attention. They are not considered essential because dogs can synthesize them in their livers. However, some dogs may have trouble synthesizing enough taurine and L-carnitine to meet their nutritional needs. These amino acids are not found naturally in any vegan foods. It is recommended that you supplement your dog with these amino acids, or be sure to choose a vegan dog food brand which contains them. Deficiency can lead to serious heart problems. Dogs technically do not need carbohydrates because they can use protein and fat for energy. However, carbohydrates are still an important source of energy and can also provide fiber, minerals like iron, and antioxidants (such as when carbs come from whole grains or fruit). If the dog doesn’t get enough carbohydrates for energy, it can start to use protein (and muscle!) as an energy source. Note that starches need to be thoroughly cooked in order for the dog to utilize them. Otherwise the starches can start to ferment in the large intestine and cause health issues. Any starches you give your dog (such as lentils) need to be cooked until very soft and ideally mashed. Unlike humans, dogs are unable to synthesize vitamin D from sunlight. If making your own vegan dog food, you will need to supplement your dog’s feed with vitamin D. Make sure any commercial vegan dog food you choose contains vitamin D. Note that too much vitamin D is toxic to dogs. More on this below in the Supplements section. There is no vegan source of vitamin B12. Other B vitamins can be found in plants, but there may not be adequate amounts to meet nutritional requirements. When making your own vegan dog food, you will need to supplement with B12 and probably also B complex. Many dogs like nutritional yeast, which is fortified with B12. It is common for dogs to develop allergies or food intolerances to ingredients like: corn, soy, and wheat. Note that you it can take a while for food intolerances to develop, so you might not see symptoms right away. Some symptoms include dry, red, and itchy skin, swollen ears, and frequently licking paws. You might also see vomiting and diarrhea. Diagnosing food intolerances and allergies can be difficult. To do so, you will probably need to put your dog on an elimination diet (meaning a diet with absolutely no common food allergies/intolerances) and then gradually add back foods and see if any cause a reaction. If your dog is lacking an important nutrient, you probably aren’t going to see the symptoms right away. In fact, it could take more than 6 months before any symptoms are obvious. During the transition to a vegan diet, you should take your dog for more frequent vet checkups and bloodwork. As with vegan cats, vegan dogs should have their urine pH regularly tested. Protein naturally acidifies urine and a low-protein diet (which can be a problem with vegan dogs because of poor protein assimilation) can result in urine which isn’t acidic enough and kidney problems can develop. Dog urine should be between 5.5 and 7. If urine is not acidic enough, you can supplement with cranberry (such as Cranimals) to increase urine acidity. You can have your vet test the urine pH or do it at home. One option is Solid Gold Pet pH testing strips and you can buy them here. Some Foods Are Toxic to Dogs! If you make your own vegan dog food or give your dog table scraps, remember that some foods are toxic to dogs, including: onions, garlic, chocolate, coffee, tea, grapes/raisins, macadamia nuts, avocado, raw dough, hops, and xylitol. Also remember that starches need to be thoroughly cooked or they can ferment in your dog’s gut. The AAFCO is the organization which sets the standards for pet food. Make sure any vegan dog food you buy is certified by the AAFCO. Avoid artificial preservatives like BHA, BHT, ethoxyquin, and propylene glycol. Look for dog food which uses natural preservatives like Vitamin E (tocopherols), vitamin C, or rosemary extract. Taurine: Not listed as essential but probably useful and maybe essential. Because Vitamin D is toxic to dogs in high dosages, talk to your vet to calculate RDAs. More on this below. Vegan dog food brands aren’t cheap. But, choosing the cheapest dog food option isn’t necessarily going to save you money. When dogs eat high-quality food, they will need to eat less of it per day, so you don’t have to buy as much. Don’t skimp on vegan dog food. Your dog’s health is in your hands! If you want to save money, then consider making your own vegan dog food or supplementing with homemade dog food. Again, I want to emphasize that dogs can survive on a vegan diet, but a diet which contains meat is going to be closer to optimum for them. To make sure your dog thrives on the vegan diet, you may need to supplement to ensure all nutritional needs are met (especially if your dog is mostly eating homemade food or table scraps). Iron: About 30mg/kg body weight is required. Zinc: Soy can inhibit zinc absorption, so it may be necessary to supplement with zinc. Wheat germ is a good source of zinc. Harbingers of a New Age makes a dog supplement called VegeDog which contains B12 and taurine. For iron and L-carnitine, you can use human supplements – just make sure you adjust the serving accordingly! You can find a chart of vegan vitamins here. According to Petmd and Doctor Mercola, dogs can’t produce vitamin D in their skin like humans do (note that a lot of websites give the conflicting information that dogs can produce vitamin D from sunlight! ), so dogs must get vitamin D from food. But be very careful when supplementing your dog with vitamin D. Too much vitamin D can be toxic to dogs. One IU of vitamin D3 is the equivalent of 0.025 mcg or 0.000025 mg of Vitamin D3. At dosages as low as 0.1 mg/kg, we can start to see signs of vitamin D poisoning. The math is a bit complicated. Rather than stress about dosage amounts, talk to your vet before supplementing with vitamin D! *At the bottom of this page, you will find the AAFCO nutrition table for dog food. Make Sure It Contains the Right Nutrients: Commercial vegan dog food brands should contain Taurine, L-Carnitine, B vitamins (especially B12), vitamin D.
Protein Type: Not all sources of protein are the same! Look for vegan dog food brands that contain a highly-digestible form of protein as the main ingredient, such as soybeans, rice, oats, yeast, lentils, quinoa, and soy protein isolate. Avoid vegan dog food which has corn as its main ingredient. It is often better to choose a vegan dog food brand with a lower percentage of protein but from a source which is more digestible. Protein requirements: the minimum amount of protein set by AAFCO standards is 18%. This may be okay for low-active dogs, but active and growing dogs will need higher protein amounts. Also bear in mind that most vegan protein sources aren’t assimilated as well as meat/animal protein, so you will need a higher protein amount. Dried Peas, Brown Rice, Pea Protein Concentrate, Oats, Sorghum, Lentils, Canola Oil, Peanuts, Sunflower Hearts, Potato Protein, Brewers Dried Yeast, Alfalfa Meal, Flaxseeds, Natural Vegetable Flavor, Quinoa, Millet, Calcium Carbonate, Dicalcium Phosphate, Salt, Potassium Chloride, Vegetable Pomace (Carrot, Celery, Beet, Parsley, Lettuce, Watercress & Spinach), Taurine, Vitamins (Vitamin E Supplement, Niacin, D-Calcium Pantothenate, Vitamin A Supplement, Biotin, Vitamin B12 Supplement, Vitamin D2 Supplement, Riboflavin Supplement, Thiamine Mononitrate, Pyridoxine Hydrochloride, Folic Acid), Choline Chloride, Minerals (Zinc Sulfate, Ferrous Sulfate, Copper Sulfate, Manganous Oxide, Sodium Selenite & Calcium Iodate), DL-Methionine, L-Lysine, L-Carnitine, Parsley Flakes, L-Ascorbyl-2-Polyphosphate (Source of Vitamin C), Dried Cranberries, Dried Blueberries, Preserved With Citric Acid and Mixed Tocopherols (Form of Vitamin E). 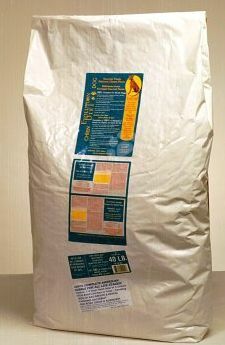 NON-GMO Whole Oats, Corn Gluten Meal, Soybean Meal, Soybean Oil, Carrots, Dried Tomato Pomace, Dried Potato Product, Dried Molasses, Deflourinated Phosphate, Potassium Chloride, Calcium Carbonate, Salt, Nutritional Yeast, Arginine, DL-Methionine, Kelp Meal, Taurine, Garlic, Enzyme Bromelain from Pineapple Stem and Fruit, Enzyme Papain from Papaya, Dried Lactobacillus Acidophilus, Fermentation Product, Dried Bifidobacterium Bifidum fermentation product, Lysine, Choline Chloride, Zinc Oxide, Ferrous Sulfate, Vitamin A Acetate, Vitamin D2 Supplement, Vitamin E Supplement, Niacin, Ascorbic Acid, Calcium Pantothenate, Manganous Oxide, Vitamin B-12 Supplement, Thiamin Mononitrate, Menadione Sodium Bisulfite complex, Folic acid, Riboflavin Supplement (Vitamin B-2), Inositol, Biotin, Pyridoxine Hydrochloride, Calcium Iodate, Sodium Selenite, Zinc Methionine Complex, Copper Lysine Complex, Manganese, Methionine Complex, L-Carnitine, Arachidonic Acid, Rosemary Extract, Cobalt Glucoheptonate. Green Peas, Chickpeas, Pearled Barley, Oat Groats, Pea Protein, Whole Flaxseed, Sunflower Oil, Dried Plain Beet Pulp, Potato, Sweet Potato, Alfalfa Meal, Carrot, Celery, Beet, Parsley, Lettuce, Watercress, Spinach, Canola Oil (preserved with mixed tocopherols), Dicalcium Phosphate, Monocalcium Phosphate, Dried Kelp, Natural Vegetable Flavors, Flaxseed Oil, Carrots, Dried Apple, Dried Blueberry, Dried Cranberry, Chicory Root, Taurine, Rosemary Extract, L-Carnitine, Potassium Chloride, DL Methionine, Salt, Calcium Carbonate, Choline Chloride, Vitamins (Vitamin B12 Supplement, Niacin, Vitamin A Supplement, Calcium Pantothenate, Riboflavin Supplement, Vitamin D-2 Supplement, Thiamine Mononitrate, Pyridoxine Hydrochloride, Biotin, Folic Acid), Minerals (Zinc Proteinate, Iron Proteinate, Zinc Sulfate, Iron Sulfate, Manganese Proteinate, Manganese Sulfate, Cobalt Proteinate, Copper Proteinate, Copper Sulfate, Ethylene Diamine Dihydriodide, Sodium Selenite). Brown rice, corn protein, extruded soybeans, potato protein, soybean oil, flaxseeds, molasses, peas, dicalcium phosphate, montmorillonite clay, sesame seeds, salt, coconut oil, taurine, lysine, L-tryptophan, choline chloride, L-carnitine, chia seeds, rice bran oil, calcium propionate, dried kelp, organic barley grass, blueberry, citric acid, apple pectic, yeast extract, mixed tocopherols, rosemary extract, chicory root, hemicelluloses extract, yeast culture, carrots, celery, beets, parsley, lettuce, watercress, spinach, minerals (potassium chloride, zinc proteinate, zinc sulfate, ferrous sulfate, iron proteinate, copper sulfate, copper proteinate, manganese sulfate, manganese proteinate, sodium selenite, calcium iodate), calcium carbonate, vitamins (ascorbic acid – source of vitamin C – vitamin E supplement, niacin, calcium pantothenate, vitamin A, thiamine mononitrate, pyridoxine hydrochloride, riboflavin, Vitamin D2, biotin, vitamin B12, folic acid), dried bacillus licheniformis fermentation product, dried aspergillus niger fermentation product, dired enterococcus faecium fermentation product, dried lactobacillus casei fermentation product, dried lactobacillus acidophilus fermentation product, dried bacillus subtilis fermentation product, dried lactobacillus plantarum fermentation product, dried lactobacillus lactis fermentation product, pepper. Notes: Does NOT contain taurine, L-carntine, Vitamin D, or B12 – you will probably need to supplement with these!